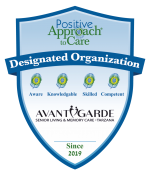 AvantGarde Senior Living and Memory Care is a luxurious senior living community, providing the highest quality care for a variety of needs. We are committed to making sure our residents’ transition to AvantGarde is smooth and stress-free. The layout of our senior living facility provides an open environment for residents to walk around and connect with other people. There is also a courtyard, golf course, barber shop, beauty salon, general store and more. Apart from this, we provide residents healthy meals three times a day. The safety and security of our residents is of utmost important to us. We’ve installed state-of-the-art equipment to protect our residents. Our staff is fully trained and qualified to take care of your loved one. They offer personalized care for each resident and encourage them to participate in a variety of interesting and creative activities that will keep them engaged, healthy and happy. Upon your arrival at AvantGarde, you will be greeted by friendly and warm staff members who will brief you on our senior living arrangements. If you have any questions or concerns, we will be happy to address them. Whether you require assisted living, memory care or independent living facility for a family member, we’ve got you covered! As a licensed senior care support service provider in Sherman Oaks, CA, we have the expertise needed to deliver exceptional senior care services. Contact us today to schedule a tour of our facility or take a virtual tour online.